Asiatic lilies are hardy flowers that are of the “true lily” variation of the Lilium genus. These lilies thrive in almost any nutrient rich, well-drained location that has plenty of sunlight and good air circulation. Asiatic lilies are resistant to most pets and insects but are susceptible to several diseases that can be detrimental and disfiguring if left untreated. Botrytis is a common problem for Asiatic lilies. This fungal disease, commonly referred to as gray mold, thrives in cool, damp conditions when rain and standing water are present. Infected Asiatic lilies develop brown spots and experience blight and growth stunt. Botrytis can infect all areas of the Asiatic lily, including stems and buds. The disease develops in the spring on fallen and dead foliage and debris from the previous summer. The fungus then travels by wind and rainfall onto the lilies and causes infection. Botrytis is best managed with the systematic removal of spent flowers and the removal of fallen and dead flowers and debris. 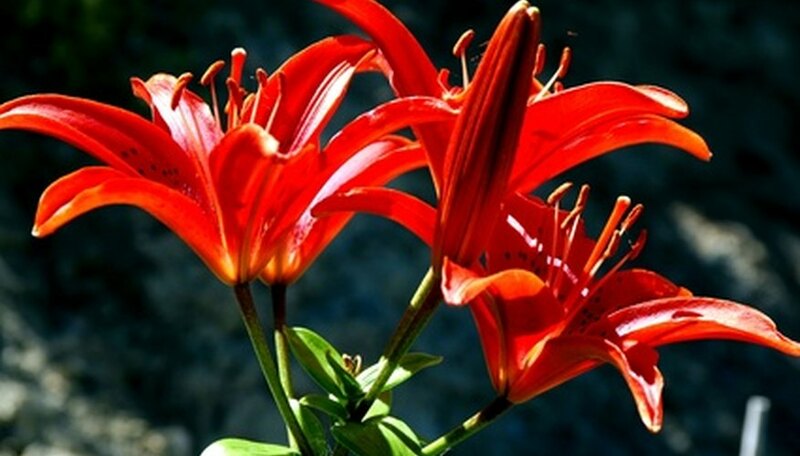 Fungicidal sprays are also beneficial in controlling and protecting the lilies from infection. Fusarium wilt, or bulb rot, is a common soil-borne disease that causes yellowing and dieback of Asiatic lilies. This disease, caused by the Fusarium oxysporum fungus, infects the lily through its vascular system. Symptoms include vascular vein wilt, yellowing of foliage, wilting, withering and death. Fusarium wilt is especially prevalent in locations that lack good air circulation, adequate irrigation and have compacted soil. The disease continues to thrive in the soil after the Asiatic lily dies. Infected lilies should be discarded, and the area should be properly tilled and disinfected. Only plants that are fusarium and verticillium wilt resistant should be planted in the area for the first five to 10 years. Pythium root rot is a fungal disease that infects the newly developing lily bulbs. It travels by microscopic fungal spores that mostly infect the lily through its root system. Although not a soil-borne fungal disease, it can thrive in the soil for short periods of time. Pythium root rot develops under wet conditions when the lily is experiencing wet feet. Infected Asiatic lilies will show symptoms such as foliage wilt, growth stunt and dieback. Infected lily bulbs will wilt and blacken, appearing scorched and mummified. Root rot can be managed by providing the Asiatic lily with good drainage and an appropriate irrigate schedule. Infected lilies may have to be discarded if the disease is not addressed in a timely fashion. Fungicidal sprays are effective when applied very early in the disease cycle. Writing professionally since 2004, Charmayne Smith focuses on corporate materials such as training manuals, business plans, grant applications and technical manuals. Smith's articles have appeared in the "Houston Chronicle" and on various websites, drawing on her extensive experience in corporate management and property/casualty insurance. When Should You Move Lily Bulbs? How Often Should You Water an Asiatic Lily Flower?